BENTONVILLE, Ark. — When Doug McMillon, who started his business career as an hourly worker at a Walmart distribution center in 1984, was selected to be president and chief executive officer of the company four years ago, industry observers expressed confidence that he would preserve the ethos established by Sam Walton, the retailer’s legendary founder. Few of them predicted the degree to which McMillon, in protecting that legacy and keeping it relevant, would go in transforming Walmart to meet the demands of a marketplace fundamentally altered by digital technology. 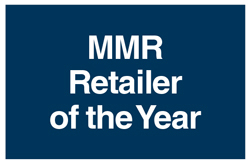 For his skill in striking the right balance between the basic principles that enabled Walmart to become the world’s largest company and the innovations needed to stay in sync with evolving consumer preferences, the editors of Mass Market Retailers have named McMillon the publication’s Retailer of the Year. “Our purpose is constant, our values are constant, but everything else is open to change,” says McMillon, who encountered Walton several times early in his career, including a Saturday morning meeting where he was questioned by “Mr. Sam” about a price rollback he put together for an item called Bait Mate. “When I moved into the CEO’s role, we said we’re about to go through a lot of change because the world is changing and retail is changing. Not only the amount but the speed of change has to pick up. Before we started down that road we had to determine what’s not going to change. Walmart has a common purpose that stands the test of time — we save people money so they can live better. We have four core values — service to the customer, respect for the individual, strive for excellence and act with integrity — and we always want to support behaviors culturally that maximize them. Everything else is potentially going to change. McMillon, who is quick to point out that openness to change has been part of Walmart’s DNA since the beginning, acknowledges that by the time he took the reins as CEO there was a need to innovate more aggressively. E-commerce was one area where the retailer clearly had work to do, but the decision was made to begin by fortifying Walmart’s existing strengths. “As we thought about what we were going to do, the plan that we formulated was to first make sure that our U.S. Supercenters, which provide a tremendous shopping experience and are the foundation of our business, were strong. McMillon and his colleagues listened, making a series of targeted investments that, among other things, improved pay and benefits for store-level employees, established some 200 training academies where workers master new technologies and learn new skills, and honed the value proposition for customers. One of the first and most significant decisions that McMillon made as CEO was to name Greg Foran, a New Zealander heading Walmart’s business in China (one of 28 countries where the company does business), to oversee Walmart’s 4,600 stores in the U.S.
“It was a little comical when the Americans on our team — and I can say this because I am one — asked what makes you think someone who’s not American can lead the U.S. business?” recalls McMillon, who first met Foran while on a retail study trip to Australia, where Foran worked for Woolworths. “But I had seen him lead our operations in China. Walmart’s become a global talent pool, and great leadership and great merchandising and operating skills translate across ­markets. Financial results for the third quarter back up that assertion. Same-store sales at Walmart’s domestic stores, excluding gasoline, increased 2.7%. It was the 13th consecutive quarter of improvement by that measure. Comparable-store foot traffic was up 1.5% during the period. Raising the level of performance at the U.S. division helped open the way for Walmart to become much more assertive in online retailing. McMillon has seized the opportunity to put Walmart on a path toward a position in omnichannel retailing that rivals its current dominance in the brick-and-mortar world. “We’re still learning e-commerce, and there’s a lot of room for improvement for us just in fundamentals,” he says. “We’ve come to realize that stores and e-commerce aren’t independent silos; it’s one customer with one experience that is both digital and physical. After years of proceeding by fits and starts, Walmart placed its e-commerce business on the fast track in August 2016 when McMillon decided to pay $3 billion in cash for Jet.com Inc., a burgeoning online merchant headed by Marc Lore, who, in addition to Jet, was involved in the founding of Quidsi, the parent company of Diapers.com, Soap.com and Wag.com. In addition to a robust e-commerce site, the deal brought Walmart fresh ideas and expertise in an area where it had previously struggled to gain traction. Jet’s Smart Cart technology was of particular interest to Walmart, dovetailing with its vision of retailing’s future. “As you think about how e-commerce should work, we want it to be a basket business and not an item business,” says McMillon. “We like to sell baskets of merchandise, since it’s a more cost-effective way for our customers as well as for us. Smart Cart technology enables us to sell a higher number of units per order than what e-commerce had historically delivered. Walmart has made rapid strides since Lore started overseeing its e-commerce business following the acquisition. Millions of items have been added to walmart.com, fulfilment capabilities have been strengthened considerably and more closely integrated with the store network, and the pivotal online grocery business has attained critical mass. Consumers are responding favorably to the changes, driving up the company’s online sales 50% in the third quarter. The retailer projects a further 40% gain during the course of fiscal 2019. Walmart has tremendous upside potential in e-commerce. Many of the 140 million Americans a week who shop its stores don’t grasp the extent of the omnichannel options it offers. While in some respects the emerging omnichannel business model, which was highlighted in advertisements throughout the holiday selling season, is a departure, it is in keeping with Walmart’s ongoing commitment to find innovative ways to serve the consumer more efficiently and effectively. “When I think about Amazon and other e-commerce competitors, the first thing that goes through my mind is that the reason they’re doing so well is because customers are responding to what they’re offering,” McMillon says. “What is it that they’re doing that we should be doing better? E-commerce enables you as a customer to have access to an assortment that you wouldn’t have otherwise had in a really easy and convenient way. In rethinking Walmart’s business for the digital era, McMillon and his team are adhering to the tradition established by Sam Walton of paying close attention to rival retailers.